Join over 40,000 others and get access to Loan Signing System's library of free resources so you can become a successful notary loan signing agent! Learn how to make money working for yourself as a notary public loan signing agent. Watch step-by-step training videos on how you can build a successful notary loan signing agent business. Master expert loan signing marketing techniques so you can get the highest paying loan signing jobs directly from escrow offices. Learn About Loan Signing System's GROW YOUR BUSINESS 2019 Nationwide Signing Agent Conference in June! Loan Signing System's GROW YOUR BUSINESS 2019 Conference is THE notary loan signing agent event of the year! Loan Signing System is an accredited "A+ Rated" company by Better Business Bureau. Whether you're just getting started as a notary signing agent, or you have many years of experience, Loan Signing System is guaranteed to help. ​If you don't get the absolute best training to build and grow a successful signing agent business or if you simply don't like the Loan Signing System course for any reason, simply let us know within 30 days and you will get a full refund. Mark Wills is one of the highest producing notary loan signing agents in the country, owner of a national loan signing service, and the course instructor of Loan Signing System, the premier notary signing agent training to thousands of people coast to coast. His YouTube videos have been viewed over 800 thousand times! Loan Signing System is an American Escrow Association Educational Partner, the premier organization dedicated to further education and professionalism of the escrow industry as a whole. By far the BEST notary signing agent course! Presented in such a professional manner, with real life scenarios, Mark provides the necessary tools for anyone to become a successful Loan Signing Agent. Great teacher providing an awesome training! THANK YOU! Anyone that is looking to become a signing agent should enroll in this course. The certifications at the larger, more well-known sites fall short in comparison. I learned this from personal experience. If you want real world examples, enroll in this course. I can not thank Mark enough for the wealth of information provided in the Six Figure Loan Signing Course. I am new to the real estate business and decided to earn extra income as a Loan Signing Agent. So I shopped around and came across Mark's website. At first I was confused because I had also researched the NNA, and thought that is all I needed to become a successful loan signing agent, but I was wrong. The wealth of information Mark gives his students you will not get anywhere else. If you want to jump start your career as a successful notary agent, I highly recommend you take this course. This course is well worth the investment. 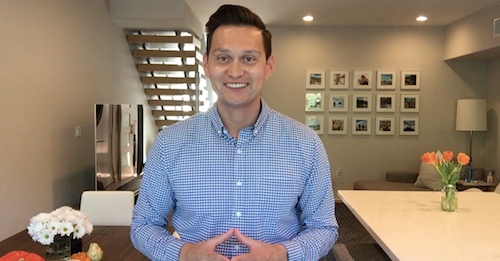 Mark takes ALL the endless amounts of info and the 'how-to process' of being a knowledgeable confident loan signing agent and teaches it in a relate-able and do-able sense. Each of us can do this... it's up to you to take this invaluable resource and make it yours. Invest in this course... you will make it back in a couple signings AND will be able to get repeat business!! Forever appreciative- will be networking and visiting escrow offices this Friday 'confidently'. Loan Signing System is an online video training course for people who want to build a successful notary signing agent business. Unlike other courses, Loan Signing System is not based on theory. It is a hands-on, step-by-step online video training course and certification based on the most up-to-date, field tested strategies and practices so you can apply them immediately to make more money as a certified loan signing agent. Whether you're just getting started, or are a seasoned veteran, Loan Signing System will give you the knowledge to build a successful notary signing agent business! All Loan Signing System Training Courses come with the Loan Signing System Agent Certification. Become notary signing agent certified and showcase your credentials in the most popular notary hiring databases like Snapdocs and Notary Resume! ﻿﻿Learn how to do a flawless loan signing to escrow standards with the Loan Signing System agent training and certification! Spend less time during your loan signing and make even more money per hour. As a bonus, you'll get to see and hear actual loan signings and learn the basics of how to get loan signings. Get the same top rated signing agent training and certification that is in the Fundamental Course, and add the most advanced marketing and business development training available for a loan signing agent! Plus, get a business coaching call with Mark! Our most advanced course designed to give you all the tools to turn being a loan signing agent into a lucrative career. Get the Professional Course with additional business development training AND six months of monthly mentorship and business coaching. Not only do you get paid $75 to $200 per appointment as a loan signing agent, you also can work for yourself on your own schedule. 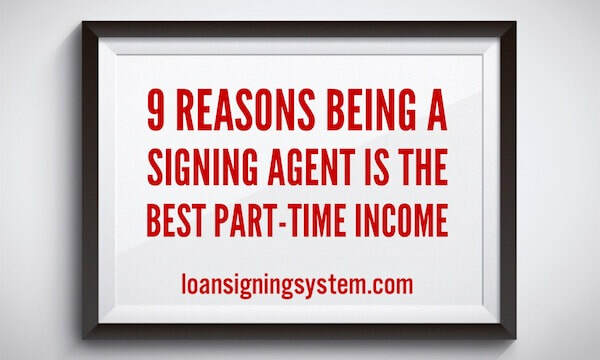 See all nine reasons why being a loan signing agent provides the best income stream! 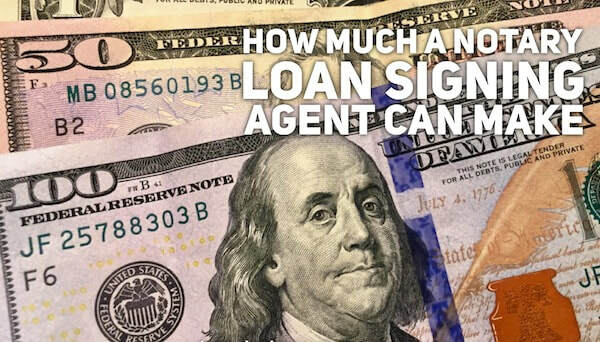 How Much Can a Notary Loan Signing Agent Can Make per Month? A notary public loan signing agent can make $75 to $200 per hour long appointment. So what is the monthly income potential for a part-time and full-time loan signing agent? Read more in this blog! 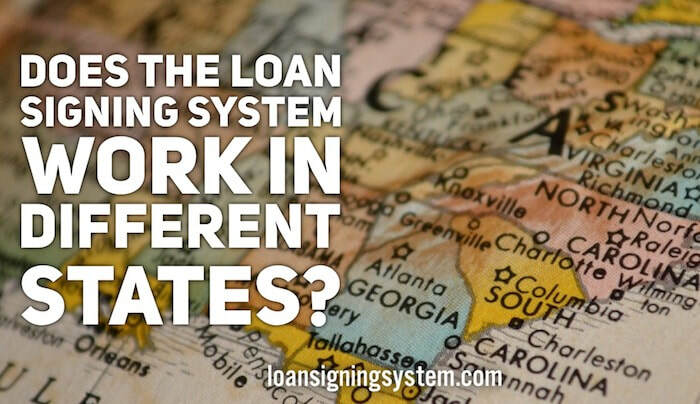 Becoming a Loan Signing System certified agent will help you become a top loan signing agent, no matter what state you're in. Ready to Learn How to Become a Successful Loan Signing Agent? Join over 20,000 others and get access to my library of free resources for notary loan signing agents. © 2016-2019 Loan Signing System, LLC. All rights reserved. Loan Signing System is a comprehensive step-by-step course created to help notary publics become expert loan signing agents. Loan signing agents can make $75-$200 per appointment and an appointment for a well trained loan signing agent can take about an hour.